These professional-level satirical duet scenes are perfect for drama competitions, a night of entertainment, or acting practice. Exaggerated characters and absurd situations from comedy writer Bill Majeski will have both audiences and actors in hysterics! 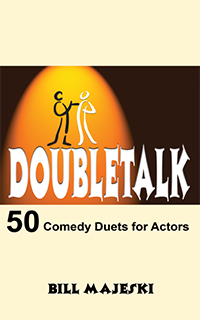 Choose from fifty comedy duets that are organized into categories for two men, two women, or one man and one woman. Each scene has simple staging, with little need for costumes or props. These royalty-free scenes provide a perfect way to practice important comedic skills like timing, characterization, and physical comedy. If you enjoyed the author’s comedic monologues in 50 Great Monologues, you’re sure to love this laugh-out-loud book of scenes for two actors! The 50 professional-level comedy monologs in this text can easily be performed by talented high-school actors. Excellent for classroom use, each monolog is three to five minutes long.